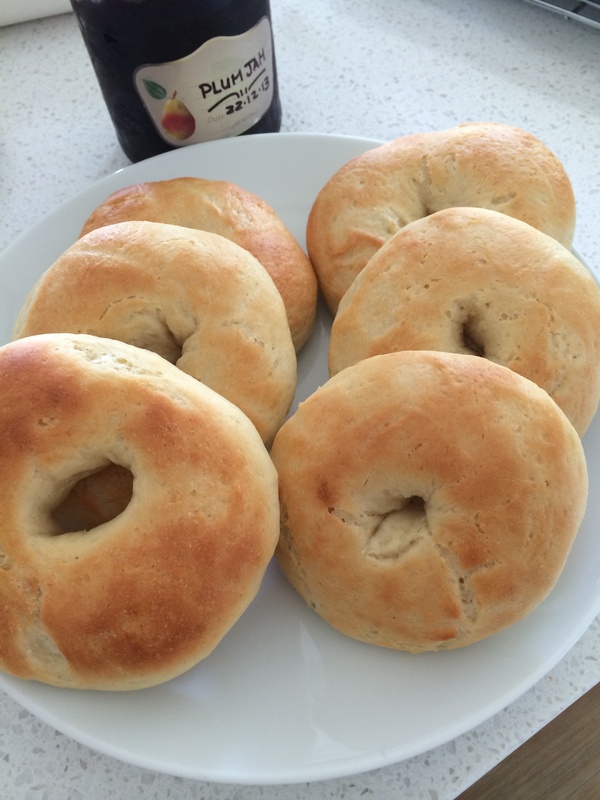 Yah… Homemade bagels made for Sunday brunch. The dough was mixed and kneaded in the thermomix within 3 minutes then left to prove. Then shaped into doughnut shapes and dunked in boiling water and then baked for 15 minutes. Note: we just added some boiling water to a bowl and dunked both sides of each bagel in the water for 30 seconds alternately. 480 gm of flour in the recipe made 8 bagels. Texture fantastic. Eaten fresh from the oven with ham, cream cheese, and salad. The recipe is from the a thermomix recipe app, “robo gourmet thermomix” But have found a recipe on the super kitchen machine blog which is almost the same except for the addition of a small amount of butter 25gm in the blog.